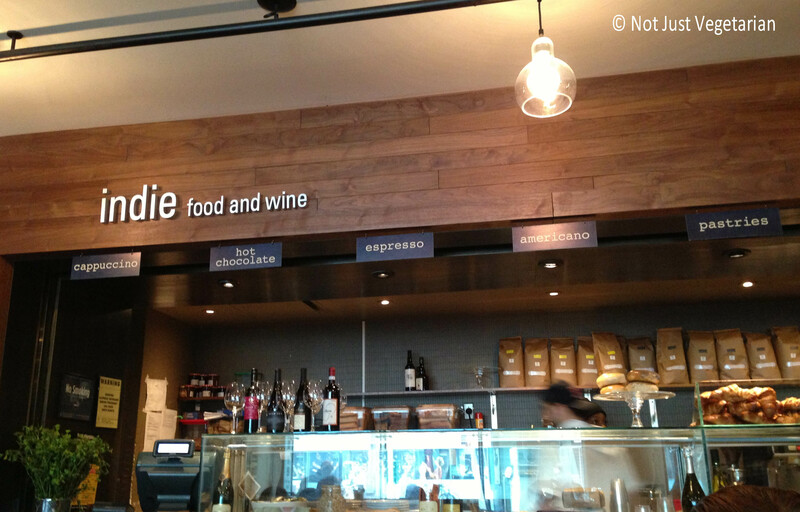 Tucked away in the Lincoln Center complex in the Film Society of Lincoln Center on 65th Street, Indie Food & Wine offers breakfast , casual lunch, dinner and concessions for the Film Society of Lincoln Center. 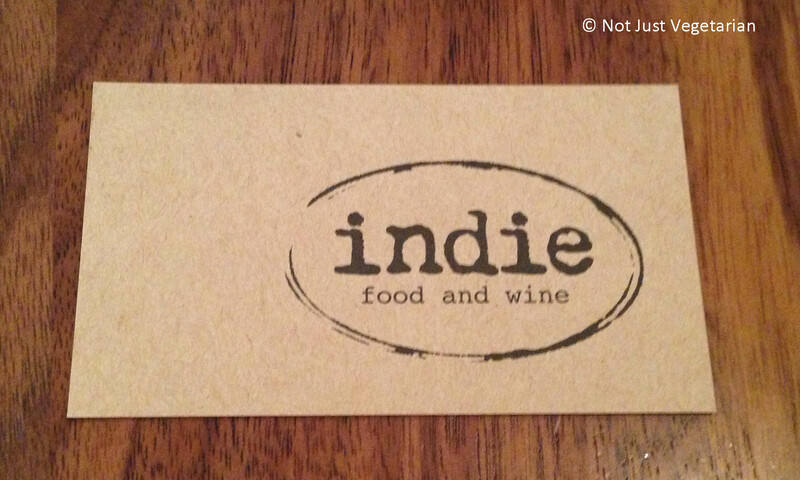 I heard very recently about Indie Food and Wine from a friend who lives in the neighborhood and she suggested that we meet there for a late morning breakfast. I was keen to try their lunch options and so went back there to meet a friend for lunch on another day. At Indie Food and Wine, Chef Jason Denton and Exec Chef Shaunna Sargent offer combinations of salads and sandwiches that are Mediterranean influenced. The choices include simple, fresh yet well-chosen ingredients that taste incredibly good together. You can get a picnic basket packed in case you want to hang out in Central Park or in the Lincoln Center complex. The restaurant does not take reservations, so you may end up waiting for a while if you go at a busy time of the day or evening. 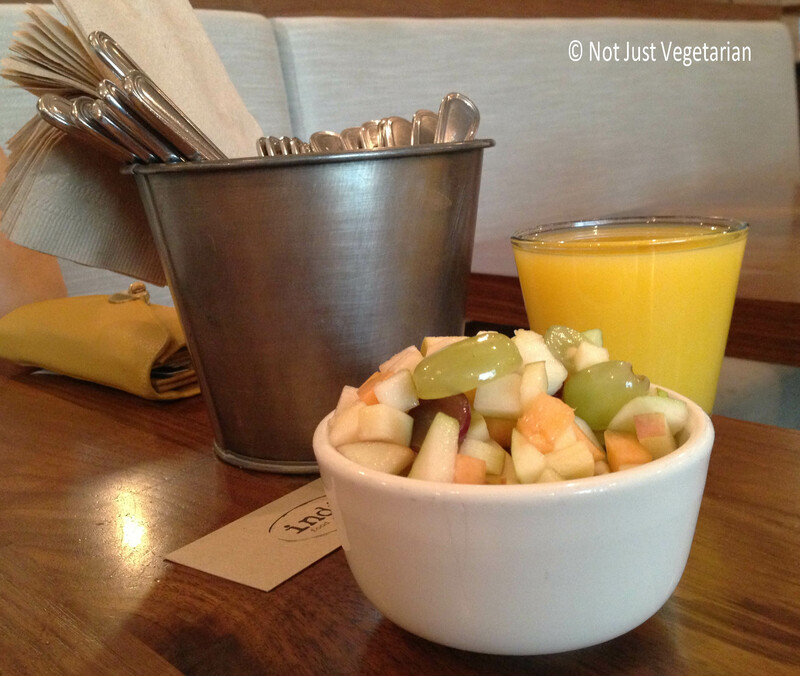 The first time that I went to Indie Food and Wine to meet a friend, I got an orange juice and she got a fruit salad. Both of these tasted just fine. The next time I went to Indie Food and Wine, I got a half sandwich and a side of Sicilian cauliflower. The bread was a baguette that looked like ciabatta, but I am not one to complain about the looks. The apricot jam and camembert cheese combination was sweet yet subtle and paired well with the sharp taste of the thinly sliced red onion and the slightly peppery watercress. I had the option of adding prosciutto, and in retrospect, think that the saltiness of the prosciutto would have been a welcome addition to flavors of this sandwich. The side of Sicilian cauliflower had caramelized cauliflower with raisins, pine nuts and chopped parsley and was served cold. This was a tasty dish, although I would have preferred a couple of more Mediterranean ingredients like olives or capers (surely these must be available in Sicily or in NYC where the side was prepared?) or at the very least, some salt and pepper. Also, I would like this dish to be served warm. My friend got a vegetable soup and a half sandwich. The soup was a very light soup that tasted like pureed squash with some pieces of red pepper. It tasted fine and healthy overall. The half sandwich that my friend got seemed delicious. It had local apple, avocado, arugula, smoked cheddar, and whole-grain mustard on multi-grain bread. I will remember to get this the next time I go to Indie Food and Wine. Or I may try some of the other sandwich or dinner options at India Food and Wine the next time I go there. 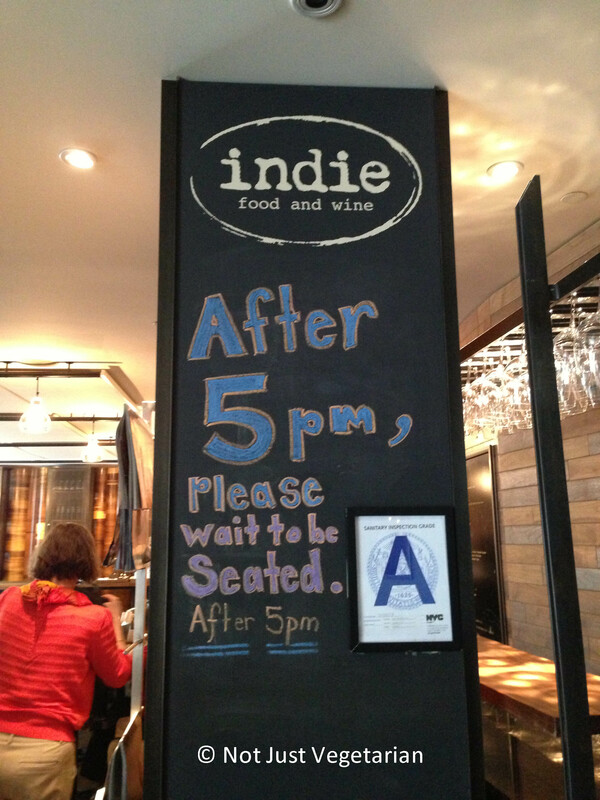 Go to Indie Food and Wine if you are in the vicinity of the Lincoln Center and enjoy the range of vegetarian and fresh Mediterranean options there. It’s a charming place-great addition to the neighborhood!